Peter Brandt and Vendaval Stud's Wow Cat leads a group of eight fillies and mares looking to test each other in Saturday's Grade 1, $400,000 Beldame at 1 1/8 miles at Belmont Park. Wow Cat, a 4-year-old Chilean-bred filly by Lookin At Lucky, is trying to advance off her third-place finish in the Grade 1 Personal Ensign on August 25 at Saratoga Race Course, where she was beaten 9 ¾ lengths by 2017 Champion 3-Year-Old Filly Abel Tasman and multiple Grade 1 winner Elate. Wow Cat was a perfect 8-for-8 in her home country, including winning the Chilean Triple Crown over males, before being transferred to trainer Chad Brown. She made her U.S. debut in the Grade 3 Shuvee on July 29 at Saratoga and fell short by a neck to Farrell after being bumped at the start. She will break from post 6 with Jose Ortiz in the irons. Blue Devil Racing Stable's Come Dancing advances to her first graded stakes try after wiring a field of five in the slop in the 1 1/16-mile Royal Delta on September 9 at Belmont. It was the 4-year-old Malibu Moon filly's first try over seven furlongs, and fourth victory from six starts for trainer Carlos Martin. Come Dancing debuted a winner as a 2-year-old, coming from off the pace to score by 3 ½ lengths in November 2016, but suffered a pastern injury, which put her on the shelf until the following year. She returned late in her 3-year-old year and drew clear to win a six-furlong allowance by 6 ½ lengths on December 14 at Aqueduct. She finished a disappointing 10th after a six-wide trip in the Interborough in January and went onto the shelf again until July, returning to best five others by 4 ½ lengths at Saratoga. She was then wheeled back a week later, fading to fourth in the Shine Again. “The last sixteenth, she got a little tired, but everything kind of went wrong with coming back quick and how the race set up and everything,” said Martin. “We gave her six weeks off and she exploded here at Belmont, so now she's got almost a month to this race and things are looking up. Come Dancing will run from post 4 with Irad Ortiz, Jr. aboard. Another who thrives at running on the front-end is the Danny Gargan-trained Divine Miss Grey, who enters off her 7 ¾-length victory in the Dr. James Penny Memorial on September 8 over the sloppy and sealed course at Parx Racing. Corms Racing Stable and R. A. Hill Stable's 4-year-old filly by Divine Park will face Grade 1 competition for the second time in her 21st lifetime start, after finishing seventh in the Test on August 21 at Saratoga as a 3-year-old. Divine Miss Grey owns three stakes victories this year in the Interborough, Heavenly Prize and Lady's Secret, respectively, all three at 1 1/16 miles. Divine Miss Grey drew post 3 and will have the services of Junior Alvarado. Multiple graded stakes winner Farrell will represent Coffeepot Stable after her fifth-place finish in the Personal Ensign. The Shuvee winner makes her ninth start of the year for trainer Wayne Catalano, who hopes to add her third victory of the year in the Beldame after the 4-year-old by Malibu Moon began her season with a win in the Pippin in January at Oaklawn Park. Channing Hill will ship in to ride Farrell from the outside post 8. Charles Fipke's Verve's Tale, a close third in a tight three-way photo in the Shuvee, will contest a Grade 1 for the third time in her career. The 5-year-old mare by Tale of Ekati displayed a strong late kick into decent fractions and looks for her first win this year while making her fifth start. Trained by Barclay Tagg, Verve's Tale will break from post 5 with Manny Franco in the saddle. Also entered to run is Mike Rutherford's Dreamcall for Hall of Fame trainer Steve Asmussen and jockey Joel Rosario from the rail; St. Elias Stable's Teresa Z for trainer Anthony Margotta, Jr. and jockey Joe Bravo from post 2; and West Point Thoroughbreds Berned for trainer Graham Motion and jockey Dylan Davis from post 7. 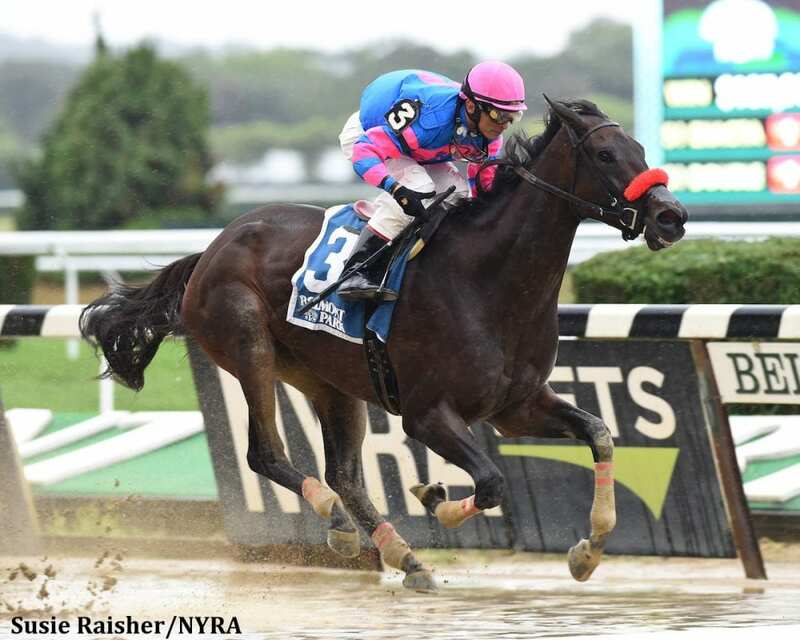 This entry was posted in NL List, Racing and tagged Beldame Stakes, belmont park, carlos martin, Chad Brown, Come Dancing, farrell, New York racing, wow cat by Anthony Affrunti/NYRA. Bookmark the permalink.